"Scientific name for Methley Plum Prunus salicina" "Fear of trees Dendrophobia". The methley plum is a product of a cross between a Japanese and American plum. It produces a heavy harvest in the year mainly in June and July does very well most of the year providing a little something throughout the year. 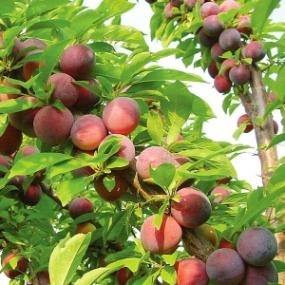 The methley plum is self fertile and requires no other plum tree in order to produce fruit. It has a sturdy growth making it possible for it to hold lots of crops without any branch breaking. The tree does not grow very tall and can only grow to a height of 10 to 20 feet. You do not have to be a professional pruner to grow this tree. It only requires a little thinning during winter for the sun to find its way to help with the ripening of the fruits. Fresh methley is very delicious and jelly made from methley is equally great. You can also use it to make leather as well as sorbet. The methley plum yields very sweet purple red plums in summer; during spring it bears white flowers with a sweet fragrant and during fall and winter season the tree is good for hanging holiday lights owing to its structural interest. The best thing about the tree is that it is resistant to disease and tolerates dry and hot conditions. It also acts as a good pollinator for several other Japanese plums. In terms of soil; the tree is adaptable to almost all types of soil. It is however ideal for zones 5 to 9. It is easy to care for this plant once it is established as it requires very little water, exposure to full sun and very little maintenance. For better results you could add compost manure in spring and some liquid seaweed. The methley plum requires little space and multiple pickings for one harvest! The tree does not only offer you a bumper harvest; it also acts as an ornamental plant!